Everybody has a digital camera these days. It can be a totally heart-sinking moment when you realize your photos have disappeared after pressing the wrong button. Now, the release of OSpeedy Photo Recovery can be good news for those who accidentally formatted their cards and don't know how to deal with it. OSpeedy Photo Recovery counts on the fact that the images aren't usually physically expunged from your memory card or hard drive when you delete them. Instead, the data is left in place but the system marks the space they occupy as usable for new files. It's not until a new file is written to the same place on the storage medium that it becomes overwritten and physically lost. OSpeedy Photo Recovery is well specialized in recovering deleted photos, pictures and images, music, video, and multimedia files from almost all the digital cards after disasters like erroneous deletion, corruption or formatting errors, etc. Compared with the other tools, this tool offers users a much simpler and easier interface. With just a few clicks, you can perform the whole recovery process on your own. OSpeedy Photo Recovery can recover photos in just 3 steps which will largely save users’ time and avoid the risk of losing photos. The whole recovery process is 100% safe. What’s more, the free scan function allows you preview the recoverable photos, pictures and images before purchasing. Learn more about OSpeedy Photo Recovery, please click http://www.ospeedy.com/photo-recovery/. Good News, OSpeedy Mobile Transfer will be released at this summer soon. Simpler, faster, more secure file transfers with OSpeedy Mobile Transfer! For most of us, things can be quite annoying that one has to manually transfer his contacts, pictures and videos from the old one when he got a new phone. And in fact, those files transfer thing can be a breeze with the help of OSpeedy Mobile Transfer. OSpeedy Mobile Transfer is designed to transfer phones’ contacts, messages, apps, photos, music, videos and other files from phone to phone, and phone to computer. With this professional Phone files transfer software, you can also back up your phone data on computer, restore your phone to its original state with simple clicks at any time. OSpeedy Mobile Transfer is compatible with varieties of phone brand, such as Apple, Samsung, HTC, Sony, Motorola, Blackberry and Nokia, Lenovo, Xiaomi, etc. Want to transfer files you’re your iPhone 6 Plus to your computer? OSpeedy Mobile Transfer can be your best choice. What’s even better, it can transfer your data between different operating system. One added benefit for iPhone users is they can import files from their iPhone to iTunes and export files from iTunes to iPhone as well by using OSpeedy Mobile Transfer. Don’t you want to transfer files between your phone and computer in a fast ＆ easy way? Let’s look forward to the release of OSpeedy Mobile Transfer this summer! Prepare to be amazed! OSpeedy Data Recovery is dedicated to be the best solution to your data recovery needs. It can perfectly meet the requirements of both business and home users who need a data recovery program with high success rate. At the same time, OSpeedy Data Recovery recovers lost data from all types of Storage Devices, Hard Drives, RAID Arrays, Servers, External Hard Drives, Flash Memory, USB Memory Sticks, SD / CF Cards and Solid State Drives (SSD) and Network Attached Storage. The intuitive wizard-based interface of this program was specifically simplified to make it suitable for users with basic PC skills and no previous experience in data recovery. It has got a simple and clean layout that gives users the possibility to select the drive to be scanned, and it scans regions of hard drive that hide those deleted but still untouched files, and gives you the option to recover them. With OSpeedy Data Recovery guides you through the recovery process step by step, you can easily recover the lost files without any in-depth knowledge of computer. In fact, it makes the entire recovering process seem nothing but a child's play. This software supports files recovery of all types and works in all major versions of Windows, starting from Windows 98. Apart from being an outstanding hard disk recovery program, OSpeedy Data Recovery can also be regarded as formatted hard disk recovery, repartitioned hard disk recovery and virus-plagued hard disk drive recovery. A comprehensive mobile transfer tool has been incorporated in the plan of Speedy HLDGS Limited. In order to fulfill the requirement of OSpeedy customers, a multi-functional mobile transfer software will be released in several days. This tool is designed for users to transfer files between phone and computer, or transfer data between iPhone to Android phones. Speedy Safe is finally released on Jan 3, 2015. Really exciting to announce that the powerful Speedy Safe program is finally released in 2015. 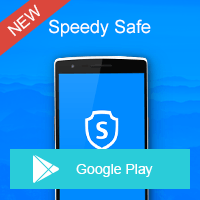 Speedy Safe is designed for Android users to optimize phone to the best state, protect private information effectively, avoid the potential attack of virus, uninstall useless App and batch backup essential files. With its easy-to-use interface, every users can use Speedy Safe as a mobile phone expert. Privacy Space: Encrypt mobile phone call and SMS, precious photos and videos and even application which you don't want to share with the others. System Optimization: Scan your phone system, clean junk files and improve the performance of your phone. Harass Blocking: Effectively avoid the telephone harassment and manage while/black telephone number list. App Manage: Uninstall useless app, and manage phone app or files in a better status. No Blue Screen, No Lock up, No Errors, Less Garbage Files Ever After. Fix Windows Errors ＆ Optimize Your PC with OSpeedy System Optimizer! Speedy HLDGS Limited, a famous software company which is dedicated to developing easy-to-use software has just issued a new product named OSpeedy System Optimizer (http://www.ospeedy.com/system-optimizer/). OSpeedy System Optimizer is one of the most useful applications which can help people troubleshoot common windows errors, clean registry errors and speed up PC. As one of the best registry cleaner, it can clear out the clutter to make your PC more stable. Being specialized in removing bad and invalid registries, OSpeedy System Optimizer offers users a rather cleaner and faster windows environment. This software is capable of automatically scanning system, identifying errors and useless data, fixing or deleting them efficiently, thus effectively reducing the workload in your computer and improving the speed and performance of your system. As a simple powerful DLL downloader, OSpeedy System Optimizer can repair missing DLL files automatically. Missing DLL problems occur when important operating system files become misconfigured, deleted or damaged. This is a common problem with computers that don’t get maintained regularly. When there're DLL files missing, what should you do to deal with it? Ignore it? Of course not. Without Dll, you could not run the computer program. In that case, you can get to OSpeedy System Optimizer for help. With its help, you could reregister the DLL files with ease and get the missing files back. A simple system optimizer you could run as part of scheduled maintenance, which prevents your PC from freezing or frequent crashes. Using it will reduce the probability of you getting a "blue screen", program not responding or lock up problems. Still, there are a lot of features you can check out on its product page (http://www.ospeedy.com/system-optimizer/), and if there's anything wrong with your computer these days, then this OSpeedy System Optimizer might be worth a look. Have Video Format Troubles? Try OSpeedy Video Converter! There are various video formats to choose from and sometimes you may encounter a file that is not in the format you need to play back on a particular device. In that case, you may need to convert that certain format to another. However, converting video from one format to another can be a real chore for those who know little about computer. Here you may have a try on this award-wining freeware named OSpeedy Video Converter ( http://www.ospeedy.com/video-converter/ ). OSpeedy Video Converter, an excellent free video converter program, can perfectly convert video or audio files to any format you could think of. It also provides clipping and cropping of videos, video merging, and batch conversion. Best of all is the fact that you can customize the frame rates and bitrates in both the audio and video aspect. This program is totally worth trying, especially since it's free, not even a "free to try." Traditionally, that means a program is very obscure, slow, limited, and hard to learn. Not so with OSpeedy Video Converter. It’s totally free of charge but not free of quality, providing excellent video quality with zero quality loss. According to users’ feedback, what impressed them most is its excellent user interface and flawless output video. The interface is very simple & intuitive, there’s nothing complex to set up or learn. All instructions are clear, and you don't have to jump a bunch of hoops to get where you want to go. The video editing function is an added benefit. It has a simple cropping tool so you could cut out a crappy video segment before uploading your video to YouTube. You can also customize the output video parameter, like aspect ratio, audio, bit rate, etc. The features are not limited. More details you could get from: http://www.ospeedy.com/video-converter/. The special prize in Speedy HLDGS Limited's raffle is an iPhone. Congrs to Daniel. She is the luckiest girl in the end of 2014. All staffs of Speedy HLDGS Limited had a really good time during the annual meeting. Speedy announced today the launch of Speedy Safe. This is an easy-to-use, and 100% free mobile APP. It owns powerful functions, supports 20+ common security tools, including Privacy Guardian, System Optimizer, Anti-theft, APP Manager, Call Blocker, Call Recorder, etc. Good News! All Speedy Software has been upgraded in the beginning of 2015! With continuous efforts of Speedy technical group, all speedy software has been upgraded in the beginning of 2015. At present, Speedy software extends its business to a new market. We plan to release an Android APP this month. Anyone who is interested in Android app, please pay close attention to Speedy official website.